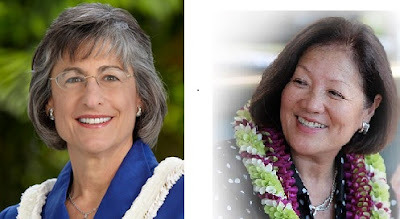 U.S. Rep. Mazie Hirono focused on Linda Lingle’s ties to Republicans in a televised U.S. Senate debate Tuesday night, linking the former Hawaii governor to Mitt Romney and other GOP figures whenever given the chance. Associated Press. Three weeks before the Nov. 6 general election, Linda Lingle and Mazie Hirono are still trying to convince voters they are the most able to work with the other party — even if they can't get along with each other. Civil Beat. Former Gov. Linda Lingle said Tuesday that she, like most people in Hawaii, was proud of Hawaii-born President Barack Obama but that the president has not done enough to improve the economy. Star-Advertiser. Rep. Mazie Hirono and former governor Linda Lingle squared off in the KITV studio in a live debate for the U.S. Senate seat currently held by Daniel Akaka. KITV4. Link to full debate video. The almost $70,000 awarded to the Honolulu Star-Advertiser for attorney fees and costs for prevailing in its lawsuit seeking the release of the names of judicial finalists from Gov. Neil Abercrombie should be reduced, state lawyers said in an appeal of the award. Star-Advertiser. It looks like it will be try, … again for the Public Land Development Corporation. Maui Now. LETTER: Former Senator Explains Legislative Subterfuge of PLDC. Big Island Now. The Hawai‘i State Association of Counties at its monthly meeting Friday voted to approve a resolution requesting the repeal of Act 55 to be submitted to each of the Hawai‘i’s four counties for approval. Garden Island. Kaiser Permanente Hawaii said it has fired 20 management and nonunion workers in an effort to streamline operations at the state's largest health maintenance organization. Star-Advertiser. Hawaii Board of Education members spent hours Tuesday grilling Superintendent Kathryn Matayoshi and Chief Financial Officer Amy Kunz over the district's proposed operating budget for the next two years. Civil Beat. University of Hawaii faculty unhappiness with President M.R.C. Greenwood is on the agenda of a Manoa campus faculty senate meeting tomorrow and Greenwood “is tentatively planning” to attend the session, her office said today. Hawaii Reporter. The Senate Special Committee on Accountability, chaired by Sen. Donna Kim, created a fascinating spectacle with its public probe of “the operational and financial management” of the University of Hawaii, triggered by the athletic department’s failed Stevie Wonder concert and the suspension of popular former athletic director Jim Donovan. Civil Beat. If the Hawaii tourism industry wants to grow the China market, it needs to start catering to Chinese the way it does for Japanese visitors. Pacific Business News. The state is taking steps to catch up on elevator inspections, but says it will take another year to do so. KHON2. State roundup for October 17. Associated Press. Three major sewage construction projects the City & County of Honolulu administration planned to complete for $88 million, actually cost the taxpayers $473 million. Hawaii Reporter. An oversized load on a truck trailer tore down a 30-foot, 5-ton section of a pedestrian overpass in Aiea, just a half-hour before dozens of schoolchildren would have been walking home on it. Star-Advertiser. The community of Hawaii Kai has been almost completely developed over the last 60 years. But venture just a little bit off of Lunalilo Home Road and you'll find one of the last remaining farms in the area, owned by 74-year-old Edwin Otsuji. Civil Beat. Immigrants accounted for almost one of every five residents in Honolulu and in Kapaa on Kauai last year, according to a new analysis of U.S. Census Bureau data. Pacific Business News. Two Puna residents have filed an ethics complaint against Puna Councilman Fred Blas, alleging he lied about a polling place not opening on time for the Aug. 11 primary. West Hawaii Today. Lawmakers on Tuesday punted on a bill that would allow Big Island residents to raise hens in residential areas, ensuring that the proposed law’s fate will rest with the new Hawaii County Council. Tribune-Herald. Big Island police will hold a second South Kona community meeting to update area residents on actions to defuse a rash of property crimes and burglaries there. West Hawaii Today. The trail to Papaikou Mill Beach took another step toward becoming public on Tuesday. Tribune-Herald. Fifteen Big Isle species could receive federal protection based on a proposal expected to be published today by the U.S. Fish and Wildlife Service. Tribune-Herald. New video from the U.S. Geological Survey shows the lava lake at the Kilauea summit at it's highest level ever. KITV4. The humpback whales are back in Maui waters. Maui News. West Maui state Rep. Angus McKelvey is hoping to pool state and federal funding to acquire Lipoa Point from landowner Maui Land & Pineapple Co. in an effort to preserve the coastal land in perpetuity. Maui News. Readers of the Conde Nast Traveler magazine have named Maui the number one island in the world for the 18th year in a row. Maui Now. Matson Navigation recently donated two 40-foot shipping containers to the Kaua‘i Habitat for Humanity. Garden Island. The public is invited to participate in safe beekeeping events at Kaua‘i Community College starting Friday. Garden Island. Larry Ellison’s luxury yacht has no boundaries, including, apparently, prohibited nature preserves. Some angry Lanai residents say the island’s new billionaire owner dropped anchor in the Hulopoe Bay nature preserve this past weekend, but skipped out before state boating enforcement officers got out there. Civil Beat.